As you can see, this rent map is pretty much a tale of tragedy. These numbers you see next to the subway stations are average “Kaltmieten” in those neighborhoods for 70sqm 2-room-apartments (Americans would call this a one-bedroom apartment because for them the living room is a given). Kaltmiete is the pure rent without the utility costs (like electricity, gas and internet) that will come on top of it (ranging from 120-250 EUR for a house like this). That means the actual rent is going to be probably 200 EUR more than the numbers you see. 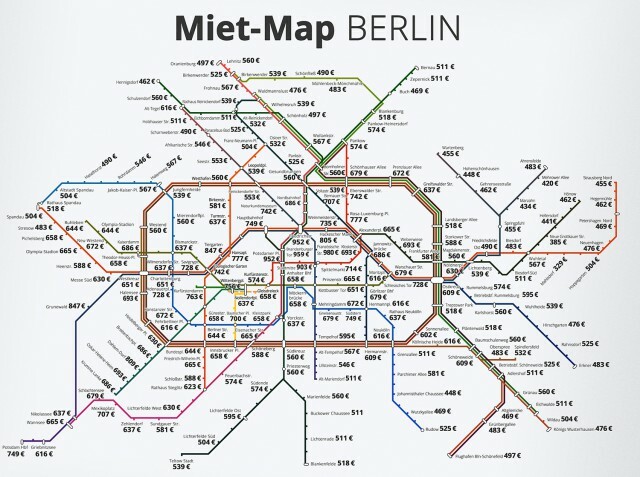 Keep in mind this is not the actual “Mietspiegel,” or average rental price. 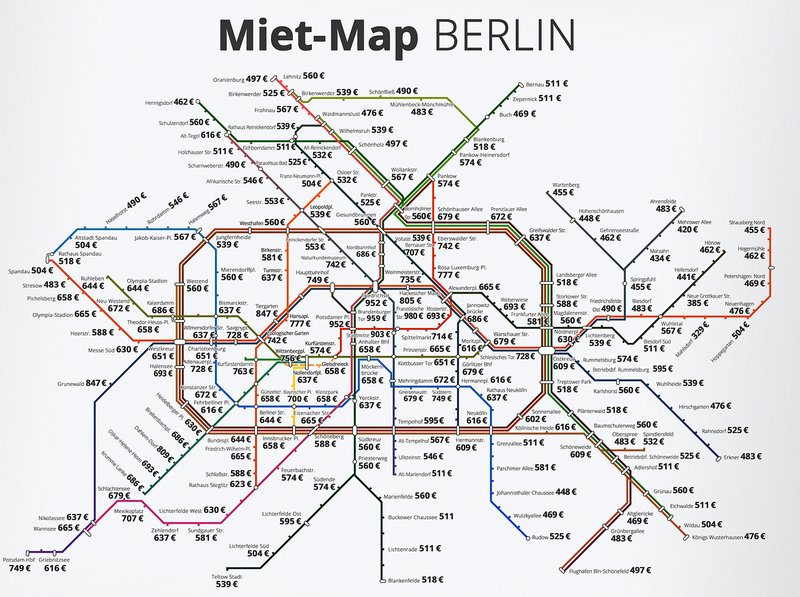 The most expensive areas are – unsurprisingly – the more central areas in Mitte, as well as Grunewald and Dahlem. But also the hype areas like Kreuzberg and Neukölln have a couple of high-priced neighborhoods, such as Schlesisches Tor and Südstern. What I also find noteworthy is that Neukölln, which is considered to be a cheap neighborhood, is not even that much cheaper than, say, Prenzlauer Berg, which is considered expensive. But now to the real important question: Are there still cheap rents in Berlin? Yes! But only if you’re willing to go further East. Hellersdorf and Mahlsdorf have the lowest rents in the city. This area is half of what you pay in Xberg and almost a third of the expensive areas in Mitte. 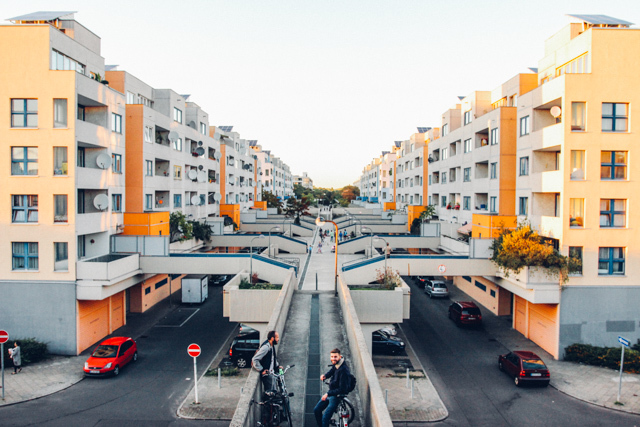 Well, the famous “Plattenbau” style is having a total comeback on Instagram these days, so maybe this is the new place to be? Same here, I will probably never move again. Ever. Should I have kids one day, they will need to stay in their own little apartment and I will come visit. Feels like this prices are outdated, for what people tells me it is more expensive. Any idea of that location on the photo? ^yeah, what’s the source of the image? Location? Hi guys, this all sounds great. I would totally go live there but I didn’t seem to find those prices or places .. Any suggestions anyone I am looking for a cheap but decent apt in Berlin. And those prices would be a total dream… And also what are the neighborhoods like good bad or ugly :-)?! These prices all feel low to me, I’ve been helping a friend find a new flat here and based on the listings at the moment could add a third onto all of these prices for the cold rent… crazy! I’m in Berlin NOW looking for apartments and the price COLD are way higher than this for 70m2 apartments. Berlin prices have gone out of control. Clearly attempts to cap the rent have utterly failed, what a pity. How long before Berlin changes forever? There ought to be more public protesting about this, greed is running riot. I would say, those prices are for 1 Zimmerwohung, that means, only 1 room, toilet, kitchen,(no livingroom). This map is not up to date at all any more! Because today those prices are what you pay per person and not for a whole flat…. The problem is this map is regarding the average, including the low rents people are paying on those 10+ year old contracts. A quick search on immobilien scout will show that the average for apartments coming onto the market is a lot higher. If you’re interested in up-to-date rent averages and medians, per Berliner district, check out http://www.rentindicator.com.